The Solemnity of the Most Holy Body and Blood of Christ (Corpus Christi) finds its origins in the popular development of the worship of the Eucharist outside of Mass during the 12th and 13th centuries. At that time, the Real Presence of Christ in the Blessed Sacrament was being more precisely defined by Scholastic theologians through the use of the Aristotelian philosophical concepts of “substance” and “accidents.” The writings of Saint Thomas Aquinas, in particular, influenced the Church during this period to use the term transubstantiation to describe the miraculous conversion of bread and wine into the Body and Blood of Christ at the consecration at Mass. These theological inquiries led to an increase in the reverence and attention given to the Eucharist outside of Mass. One of the manifestations of this heightened devotion was the introduction of Eucharistic processions, the first evidence of which comes from Cologne, Germany in the 1270’s. By the 14th century, the practice of processing the Blessed Sacrament on the feast of Corpus Christi had been adopted throughout Europe. 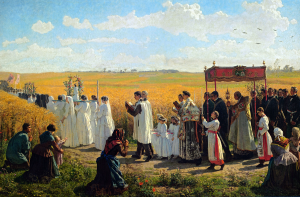 In cities and towns, these processions took place in the streets, but, in rural communities, Eucharistic processions usually took the form of a procession through the fields. In this latter setting, four outdoor altars were often constructed, and the beginning of one of the four Gospels was sung at each altar, respectively. Petitions for ecclesial and civil needs followed, and benediction with the Blessed Sacrament concluded the service. 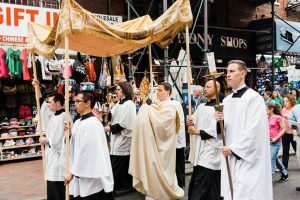 In the Baroque era, Corpus Christi processions sometimes took on extra-liturgical characteristics and became akin to parades, with floats that depicted scenes that had no clear connection to the Eucharist (e.g., Saint George slaying the dragon). During this period, it was common for bishops to ask priests and faithful to redirect their attention to the gift of the Eucharist in Corpus Christi processions. The Church’s liturgical books continue to encourage the carrying of the Eucharist in procession on the Solemnity of Corpus Christi, describing this practice as “desirable” (cf. Roman Missal, Mass formulary for Corpus Christi; Ceremonial of Bishops, 386). The purpose of such processions through the streets is to give public witness to the faith of the Christian people and to manifest their devotion to the Blessed Sacrament. Consequently, processions solely within the body of a church are no longer permitted, and processions with the Blessed Sacrament should usually go from one church to another. However, if necessary, a procession may return to the same church from where it began. The ritual book Holy Communion and Worship of the Eucharist Outside Mass indicates that it is for the local Ordinary to decide on the advisability of such processions and to approve a place and plan that will ensure that these movements are carried out with decorum and reverence (101). In addition, suitable arrangements should be made with public authorities and law enforcement officials in order to provide for the safety of those who will participate in processions. Ideally, the Mass of the day will immediately precede a Eucharistic procession. Following the distribution of Holy Communion, a monstrance is prepared and placed on the altar. The Prayer after Communion is offered, the Blessed Sacrament is incensed, and the procession then begins. Eucharistic songs and hymns which are easily sung and memorized should be led by a choir during the procession. While not required, the traditional custom of stopping at stations in order to proclaim the Word of God and give a Eucharistic blessing may take place. A canopy or baldachin held over the Blessed Sacrament may also optionally be used. At the conclusion of the procession, benediction with the Blessed Sacrament should be given in the church where the procession ends. The Blessed Sacrament is then reposed. Lastly, it should be noted that the practice of processing through the church with the exposed Blessed Sacrament at prayer services for healing in order that the faithful might touch either the monstrance or the humeral veil of the celebrant (in imitation of the hemorrhaging woman who touched the hem of Christ’s garment in the Gospels) is not envisioned by the Church’s liturgical books. Pastors should remind sick members of their congregation that the reception of Holy Communion is the preeminent way for them to enter into union with Christ in the Blessed Sacrament. As well, those who suffer from serious illness should be encouraged to receive the Sacrament of the Anointing of the Sick. Lastly, the sick who are able may be invited to regularly spend time with the Lord in prayer during Eucharistic exposition and be present for benediction with the Blessed Sacrament.